Top scholarships for pursuing MBA out of India . MBA Study Abroad. Brighter employment prospects, better career growth, higher pay packages and a thirst to learn about a different culture are some of the reasons driving students to pursue their (Master of Business Administration) MBA study abroad as most preferred higher education option. There are many benefits to getting an MBA from a foreign university, not the least of which is the experience of living in alien conditions and the adaptability it encourages students to develop. However, not everyone can afford this amazing opportunity. Lack of financial assistance robs millions of Indian students of the attractive proposition to pursue MBA Study Abroad. As the popular adage goes, however, “Where there is a will there is way”. 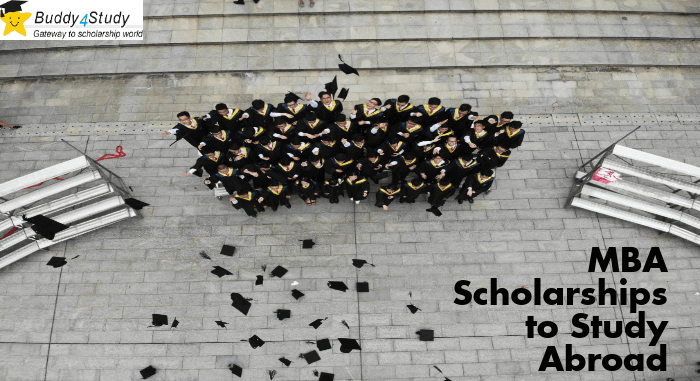 Buddy4Study provides students a way to make their higher education affordable by listing out a host of scholarship opportunities for all categories. Listed below are a few scholarships that can help you pursue an MBA Study abroad. Graduate students who have been accepted to study Master of Business Administration (MBA) from University of Strathclyde, Glasgow can apply for this scholarship. Students will be rewarded on their MBA application and performance basis. The university is giving impressive rewards through this scholarship for MBA Study Abroad enthusiasts. The Imperial College Business School, London is seeking applications from meritorious students holding first class honors or an equivalent international degree, a sound GMAT/GRE score, and an exceptional track record of professional achievements. The objective of this scholarship is to provide students with an opportunity to pursue full time MBA study abroad at the business school. Women who want to take up MBA Study Abroad as a professional course are provided with an opportunity by the TU Wien University, Austria to apply for the Professional MBA Facility Management Class. The scholarship is open for only female candidates. The program aims at people interested in attaining qualification and expertise in general management while dealing with real estate and infrastructure at the same time. Meritorious students entering the full time MBA programme at Newcastle University can apply for the Business Excellence, MBA Business Excellence and MBA Leadership scholarship. Students holding the full time conditional or unconditional admission offer from the university are eligible for this scholarship. The university has some impressive rewards to give to each selected candidate and what could be better than a chance to pursue MBA Study Abroad with financial assistance. The UBS international center of economics is inviting meritorious graduate students to apply for this scholarship. The objective of this MBA Study Abroad scholarship is to encourage students to pursue doctoral studies at the Zurich Graduate School of Economics, run by the Department of Economics at the University of Zurich. It is a 4-year long scholarship depending upon the satisfactory level of course completion with impressive rewards.